No Indian wedding is complete without dance, music and drama. They are in fact the highlight of the ceremony. 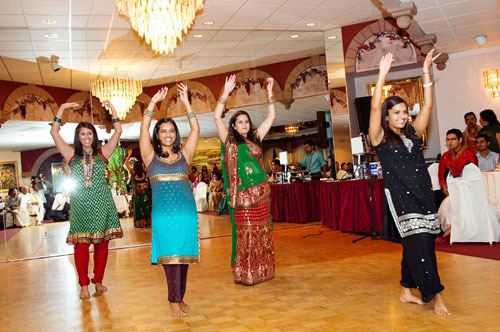 The sangeet ceremony is entirely dedicated to dance, music, fun and merry making. Indian regional and bollywood movies come up with various desi shaadi songs for the snageet ceremony every time. Some are emotional ones, some are romantic. Some of the songs are item numbers; some are happy-to-get-married songs. Some of the songs can be combined to make a story; some can be put together as a theme. Overall the songs are about emotions which get translated with the beautiful lyrics to craft a wonderful aura. Groove on anything from ever green ones to the latest ones. The choice is yours! Yeh galiya yeh chaubara (a heart touching song. Film-Prem Rog).